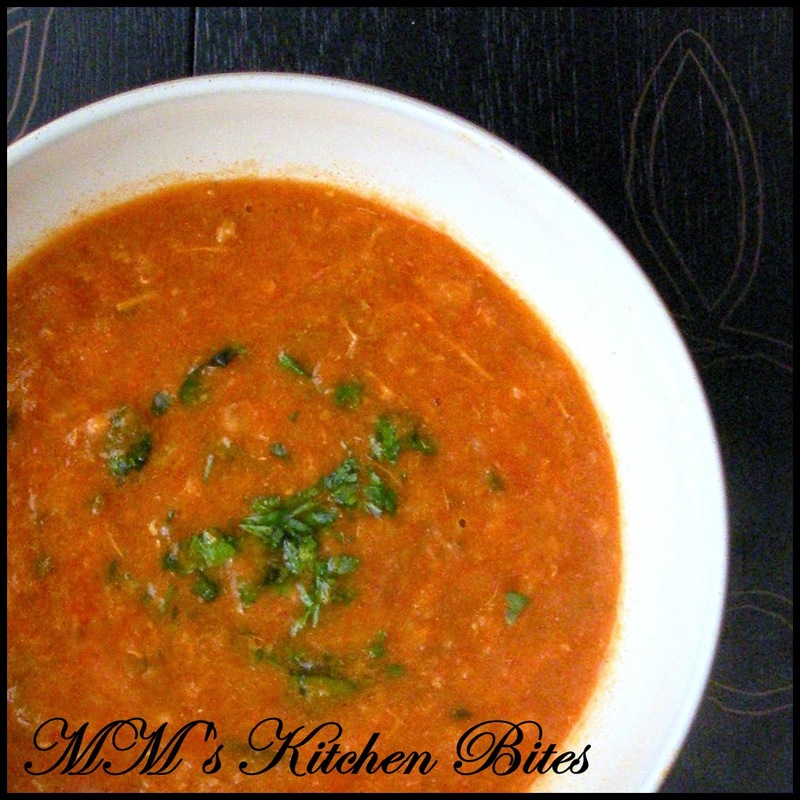 MM's Kitchen Bites: Mulligatawny Soup…Surprise!!! 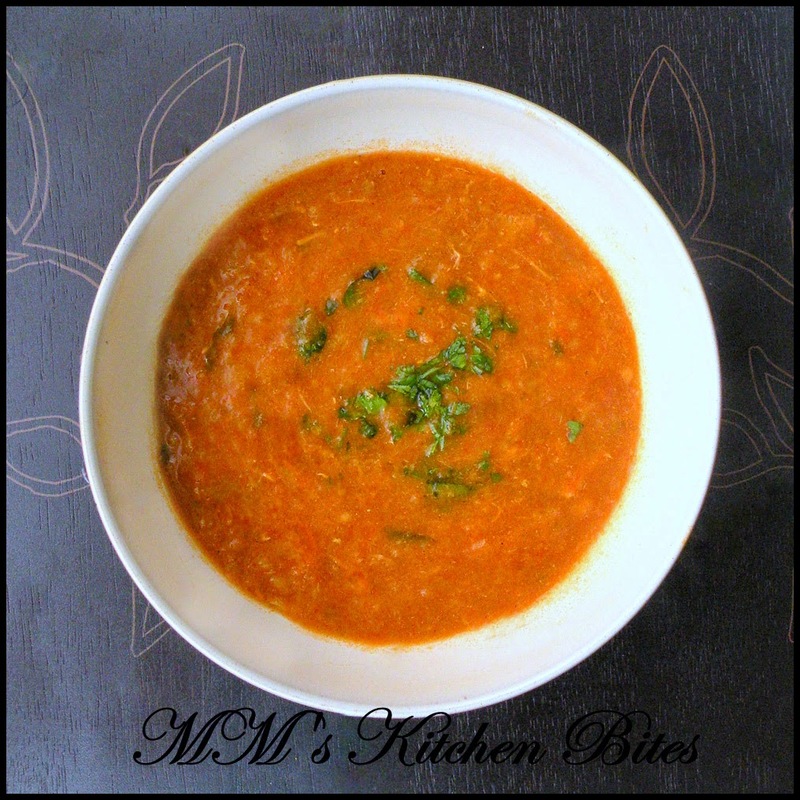 Mulligatawny Soup…Surprise!!! Yes, that is what is it is like to order a Mulligatawny soup…because you never really know what you will get!! The colour can vary from pale yellow to dark red…the ingredients vary – as mentioned below in ingredient listing and the long notes section below…and so does the consistency – can be thick, thin, blended or chunky…IMO, there is no right or wrong version but yes, a couple with some strange ingredients!! J...but, ideal for this kind of weather (to make as well as to eat) no matter what the colour, ingredients or consistency is!! Heat the oil in a large saucepan or Dutch oven. Over medium high heat, stir in the onions, potatoes, carrots and celery. Once the onions start to soften and the potatoes begin to brown, add in the garlic and green chilies. Sauté for a minute or so. Lower the heat and add in black pepper powder, red chili powder, cumin powder, turmeric powder and coriander powder and toss to coat. Add in the lentils, tomato, tomato puree and ginger paste. Stir and mix well with the vegetables and let it cook for a minute. Increase the heat to high and add in the stock. Once the stock comes to a boil, reduce the heat to medium low and leave to simmer for about 30-40 minutes, stirring occasionally. The vegetables should get tender and dal completely cooked. Cool slightly and then blend the soup either using an immersion blender or a food processor. You can leave the soup chunky if you want or only blend about half the portion. Transfer back into the pan and add in the cooked rice. Add more stock/water to adjust consistency but do remember that coconut milk is yet to be added in. Heat the soup again till piping hot. Add in the coconut milk, salt and taste and adjust seasonings. Simmer for 4-5 minutes. Switch off the heat and mix in some lemon juice. Garnish with parsley or coriander. If using leftover cooked meat, shred into tiny pieces and add about 15- 20 minutes before switching off the flame. Only use sliced onions, ginger, garlic, dal, spices and boneless chicken pieces. No blending and add in the cooked rice just before serving. Only use sliced onions, ginger, garlic, spices and boneless chicken pieces. No blending and add in the cooked rice just before serving. Above option 1 and 2 but without rice. Above option 1 and 2 with coconut milk added. Above option 1 and 2 with tomatoes added. Use coriander seeds and cumin seeds. Dry roast them first and then grind into a powder. Lemon and Garlic Chicken...Thanks Mo!! Chicken Fried rice…fooling Monday blues!! Vegetable Fried Rice..take 2, action!